Occoquan Bible Church: Woodbridge, VA > TLI Update: Whatever the Cost, Jesus is Worth It! 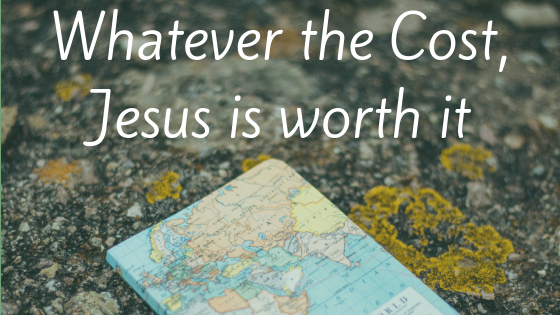 TLI Update: Whatever the Cost, Jesus is Worth It! As I think about this past month, I’m grateful to God for all His goodness and am amazed at His wonderful plan for His church. I’d like to review the last few weeks by highlighting three events: (1) the field security seminar I attended in October, (2) Dr. Allaboe’s visit from Togo, and (3) attending the annual meeting of the Evangelical Theological Society. Training Leaders International (TLI) requires all staff who lead international trips to take a field security seminar that focuses on how to be safe in difficult areas where there might be opposition to the gospel or political unrest or civil disturbance. The site for the seminar was beautiful, a dude ranch outside of Colorado Springs at an altitude of 8,000 feet. However, we didn’t have a lot of free time to enjoy the scenery. Instruction both outside and inside the classroom was done by people who are in law enforcement or who have been involved in security situations all around the world. One man has negotiated over 100 hostage situations. We even heard a brief recording of a telephone conversation he had with someone held in captivity, and we were also able to read notes from a terrorist group that did surveillance on a missionary compound for 18 months. We were taken hostage, rode in a caravan through a difficult checkpoint, and were even ambushed. They did a very good job of making it all realistic. Hoods, yelling, shooting, interrogations, etc. It was physically and emotionally exhausting, but it was a very good learning experience. The seminar ended with a 17 minute video produced by ISIS. Wow! Spiritual warfare at its most intense. Then we saw a video of Heather Mercer, who was arrested by the Taliban in 2001 and imprisoned for 6 weeks. In 2003 she returned to Iraq to minister to Muslims. Her recurring phrase was, "Whatever the cost, Jesus is worth it!" In November, Dr. Sylvain Allaboe, the director of the school in Togo where I taught in May, visited our home and our church. We enjoyed his company and getting to know him better. For the first time I heard his testimony in more depth – how he was saved out of voodoo. People in his village were horrified, and many even thought he would die because he was a follower of Jesus. But, of course, he is still very much alive! He described how there is a thriving church now in his home village, and voodoo worship has diminished significantly. He did, however, warn that this decrease in visible voodoo worship does not mean that voodoo is on the decline. On the contrary, the trappings of the religious practices of voodoo are being picked up by government officials and cultural icons and paraded as the cultural heritage of Africa. In other words, if you speak or teach against voodoo, you’re a traitor to your heritage and people. In a fallen world, opposition to the gospel comes in many forms. If you desire to spread the gospel and speak up for Christ, you will face opposition. It may be religious persecution, it may come from political unrest, it may be that you have violated cultural norms, it may be simply that you have offended sinners who want to remain in their sin. But the good news is that Jesus has already won the battle. To stand up for Jesus is not simply to be on the winning side, it’s to be on the side that has already won! And that brings me to the last event. I’ll end this post as I started it: I’m grateful to God for all His goodness and am amazed at His wonderful plan for His church. In spite of the opposition of Satan and in spite of cultural barriers and sin, the gospel is spreading around the world and men and women of God are seeking to understand more of the implications of God’s wisdom and grace. It’s a great honor to take that gospel to those who need to hear, it’s a great honor to participate in the training of those who are spreading that gospel, and it’s an equal honor and necessary work to support those who are going and teaching and praising God in every corner of the globe. By God’s amazing grace, and only by His grace, we’re all in this together, building His church for His glory. Do Good Things Happen to Bad People?